If she did have kids, I think they all died... historically. Thanks. No wonder he spotted a moustache when he returned to palace. Because of his vast travels, there are many man written stories about his travels. Haven't watched that yet. But I think based on past dramas, He spent more than a decade travelling. How old was QL when he started his travels? I think historically, the first Empress died quite young. Ruyi died around late forties. And QL outlived them all. @outsanity QL was hated by all the readers of the novel. He was selfish and insecure. He did not even treat his childhood love, Ruyi, well although he told her that he would look after her. OMG, I saw the trailer on my favourite maid. My heart broke. Hell to the person who harmed her. That is right. He never has a personal weibo and does not believe in having one. The studio weibo hardly posts anything. So it really does not matter. Those who kind of know him probably isn't too surprised. Also, the company weibo is looked after by staff not him. I like her very much. The thought of it breaks my heart. Empress.. Empress is Dowager's favourite and probably from prominent family so QL is not able to do much. She does appear gentle and kind but behind that behind that face she is cunning. Her mother is aiding her by sending a cunning maid to plot for her. Ep33-34 Did Hailan give birth to boy or girl? I love these photos. So real. Reminds me of my grandparents family photos. Me too. I like Sioxin very much. Such a kind loyal being. She deserves a good life. Oh why did Lianxin in drown herself? Anyone watched Ruyi promo? Sioxin looks pretty tall in real life. I remember the scene where she told QL about the idea of one man one wife and QL scoffed at the idea. Being young she thought QL's reaffirmation of their love will last forever. I think one really have to be loveless to survive in such an environment. Thanks all for the explanation. So everyone running away from Consort Gao's residence because of smallpox? @Cassie That was Yongzheng's advice to Hongli. He cannot do what he really want to do. I am not sure which is worse. 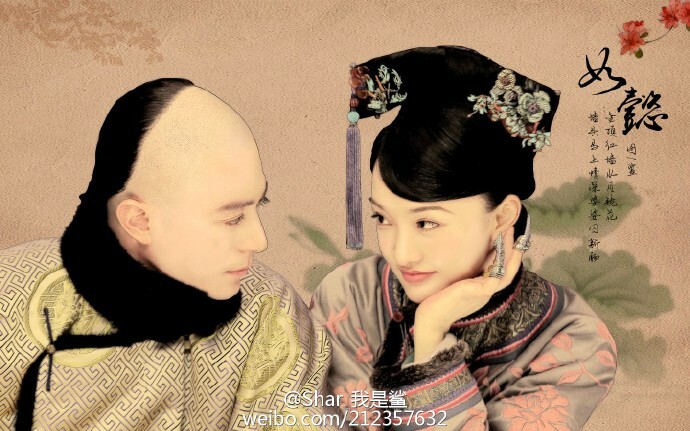 Being an unloved concubine, married to.an old man, sold to be a forever servant? Girls were not valued those days. Good luck to those who were born into poverty. The emperor needs to learn how to manage his harem.before he can manage the country. LOL. I do not like long dramas but this drama is quality drama. The detailing is amazing. I like tha cast and think they are doing a great job. Hated the mean ones yet felt sorry for them towards the end which shows that they allowed each character to develop snd grow on us. Consort Gao was not only jealous of Ruyi but she tried too hard to be on Empress's good books and became her tool unknowingly. I agree with some of you that Consort Jia is clever and manipulative. Always instigating without the others knowing. What do you guys think of Aruo? Why did she refuse to spill the beans even when tortured? The dagger eyes the Emperor gave her when she refused to tell the truth gives me the shivers. Probably so. I watch them raw from Tencent. Up to ep30 only. I read that the plain clothes were what they wear during unofficial events. In one of the eps, Empress Dowager asked Ruyi to draw her brows and said something to her. What did she say? So true. She loves she despairs. If there is no love there will be no disappointment and the process will be purely a mean to an end. Much like Hailan, means to survival. But she has a good heart so she would not hurt unnecessarily.